How a luxury timepiece can become a family heirloom. Digital devices like smartphones and similar accessories can rapidly become obsolete. So instead of giving dad or the grad in your life a gift that might need to be replaced in a few years, consider the long-lasting gift of a luxury timepiece. Fine watches from local jewelers are beautiful and technological marvels in their own right, with the bonus that they can become a collector’s piece or a family heirloom. Joshua Wilkes, watchmaker for TimeScape in Edina, admits that mechanical watches might never be as accurate as a $20 quartz from Target, but that’s not the point. “The reason to buy a high-end mechanical watch is an intentional enjoyment of, or nostalgia for, old things,” he says. Wilkes, whose appreciation for handcrafted excellence stretches back to his childhood days spent building Legos, believes luxury watches are still some of the finest things humans make by hand. Like many luxury watch retailers, Scott Rudd, owner of Scheherazade Jewelers in the Galleria, has traveled to Switzerland several times. “Watch-making is almost like a religion there,” Rudd says. 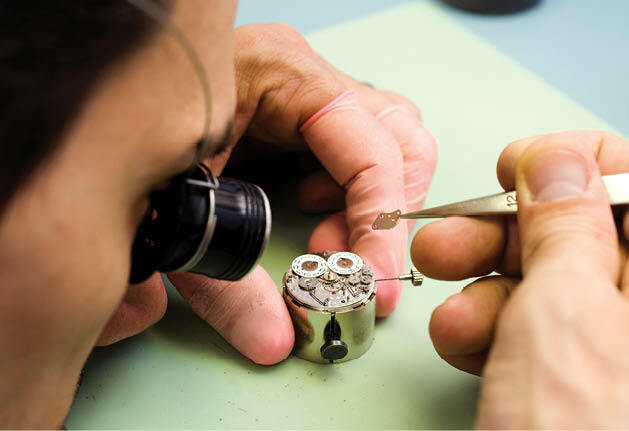 A passion, history and competitive spirit spurs on Swiss watch makers to create better and better timepieces, continuing a legacy that thrives for a reason. Much like having an appreciation for fine art, “a person of any age or gender can appreciate a timepiece with a history and a legacy,” Rudd says. Watches are also a fashion statement. Those who appreciate fine things want to accessorize with a terrific watch the same way they would with a fine piece of nonfunctional jewelry. Moeller says it’s a misconception that the rising popularity of cellphones has made wristwatches less popular. “Watches are as popular as ever because people want something of quality on their wrists.” He also notes that checking your cellphone during a business meeting is impolite. You can help young people avoid this faux pas during job interviews or starting out in their careers by introducing them to an appreciation for a quality timepiece. Moeller notes that frequent fliers and pilots like a second time zone feature. “They appreciate being able to keep track of the time at home while in Europe, Asia or Los Angeles,” he says, noting that each function has its original purpose and also more practical purposes for daily use. For example, a tachometer is designed to judge speed and a chronograph serves as a stopwatch. Practical applications can be to keep track of a child’s 10-minute timeout, time the perfect doneness of a steak or keep track of time left on a parking meter. “Most people aren’t going to take an $8,000 Rolex dive watch 1,000 feet underwater,” Moeller says. “But you know you don’t have to worry about where you wear it. It can withstand most anything you throw at it.” Plus, guys like gadgets. “I’m not a farmer, but I think the moon phase watch function is neat,” Moeller says. Once you’ve settled on preferred functionality, these Edina experts can guide shoppers through selecting the latest watch fashions. All agree that the popularity of extremely oversized watch faces from a few years ago has come back down to earth. Retailers were once selling many watches for men that measured up to 45 or 48 mm. The current sweet spot seems to be between 40 and 43 mm. More size selections are now being offered in women’s watches as well. Rudd notes that the best-designed watches are not over-designed. 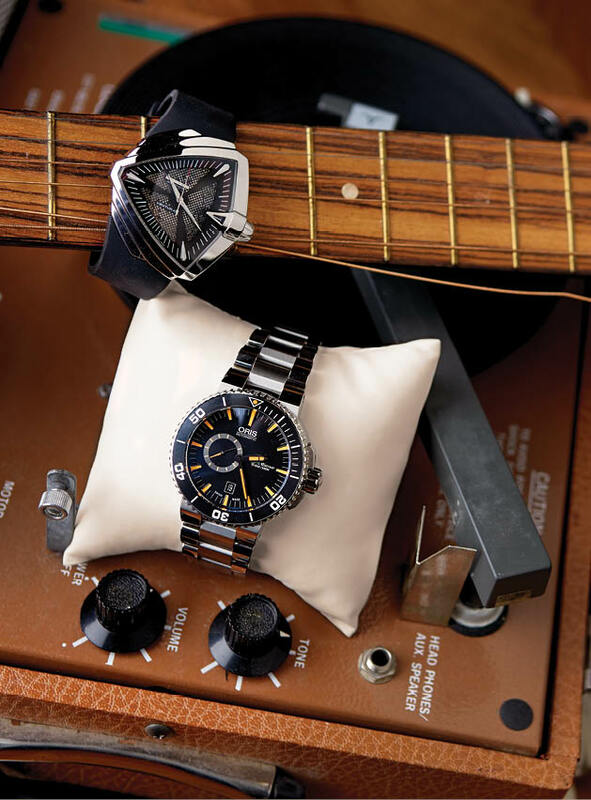 “The best sellers, day in and day out, are timeless modern classics made by companies like Oris or Hamilton,” he says. 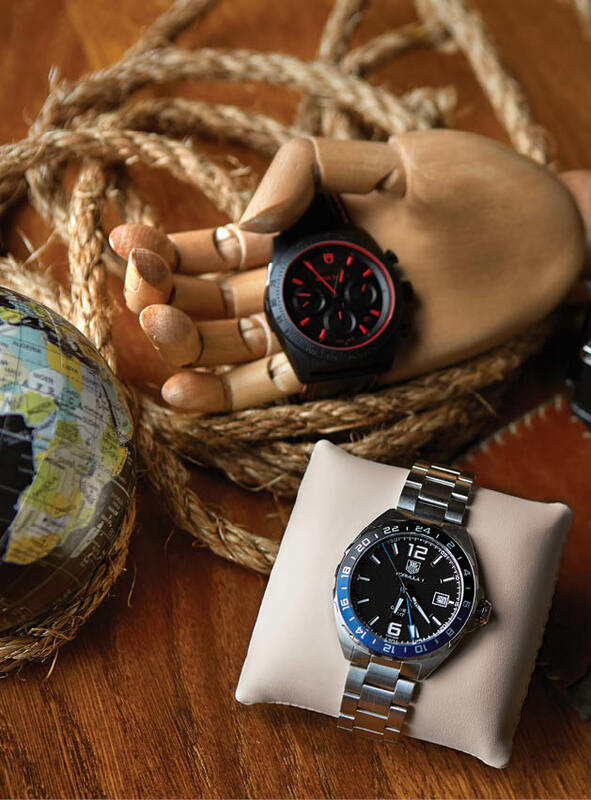 So whether you’re looking to spend $100 or $100,000 on a classic style or something sporty for weekends, these local watch sellers offer top brands at a variety of price points. And their Swiss-trained and certified watchmakers can ensure the continued quality and enjoyment of your investment. Features: An 18K rose gold 42 mm case with a silverized dial and a crocodile strap. Patented instant time zone adjustment. Water resistant to 98 feet. Features: A stainless steel bracelet style strap and 40 mm case with a blue enamel watch-face dial and a classico chronometer. Water resistant to 164 feet. Features: Touches of the unexpected give this classic inspiration a futuristic and edgy feel. An angular crown is integrated into the case with its pointed tip signaling 3 o’clock. The black dial sports racy looks and a touch of fiery red. With a nod toward Elivs Presley, one of the first celebrity fans of the brand, this watch celebrates modernity with a case that elegantly flows into a stylish, smooth black rubber strap. Features: A 46 mm stainless steel case with a scratch resistant ceramic bezel, uni-directional timing function and a sapphire crystal cover. Water resistant to 1600 feet. Features: A high-tech matte ceramic case made from a single piece of injected ceramic and a leather strap with red stitching. Waterproof to a depth of 500 feet. Features: A Swiss made, TAG Heuer Calibre 7 movement and a fixed steel bezel with a black and blue aluminum ring for day and night indications in dual time zones.